“We, the People, in order to form a more perfect union.” Those are the first eight words of the preamble of our Constitution, the foundation of our system of government and politics. When I ran for Governor in Michigan, I aimed to advance universal healthcare, a sustainable energy system, access to public goods and services, and against corporate capture of our economy. And yet the focus was nearly always on my name, my faith, and my ethnicity—that I could be “first Muslim Governor.” In union halls, living rooms, and town watering holes across Michigan, I had the opportunity to listen to and learn from Michiganders—as a millennial, Muslim-American candidate. In this talk, I reflect on the roles of identity and ideals in our current political moment. I argue for a politics of empathy, that centers our actions on the systems of oppression, rather than its symbols, and embrace the responsibility to speak truth to power, only after we’ve learned to empathize with pain. I center these in what it means to be “more perfect,” advancing mutual aims from diverse perspectives in a pluralistic society. 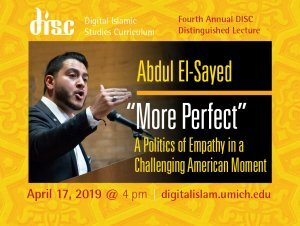 Named “The new Obama” by The Guardian, Dr. Abdul El-Sayed is a physician and public health expert who ran to be the first Muslim-American governor of Michigan. His campaign excited Americans, with his progressive focus on public health, education, diversity, and dialogue. Before running for governor, El-Sayed served as Health Commissioner in Detroit, where he rebuilt Detroit’s Health Department after it had been privatized during the city’s municipal bankruptcy. For full bio, visit http://myumi.ch/6k4q8. The Digital Islamic Studies Curriculum (DISC) aims to provide students with global perspective on Islam and the Muslim world by coordinating an Islamic studies curriculum across the Big Ten via synchronous videoconferencing and distance learning technology. DISC is supported by the Andrew W. Mellon Foundation and housed at the U-M International Institute. The Annual DISC Distinguished Lecture features a prominent scholar or public figure speaking about issues related to Islamic studies. Organized by the Digital Islamic Studies Curriculum (DISC), with support from the Global Islamic Studies Center, Center for Middle Eastern and North African Studies, Interdisciplinary Islamic Studies Seminar, and International Institute. 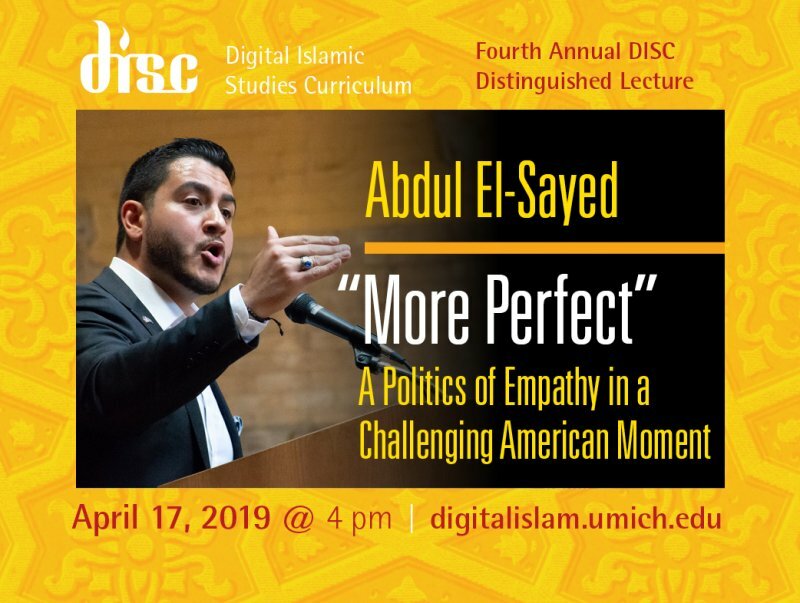 If you are a person with a disability who requires an accommodation to attend this event, please reach out to digital.islam@umich.edu at least 2 weeks in advance of this event. Please be aware that advance notice is necessary as some accommodations may require more time for the university to arrange.